Option lists are powerful tools we can use to improve and facilitate the check-in process for end-users. At first look, the creation and configuration can be somewhat, intimidating. In this edition of SENA Sound Bites the goal will be to reduce the fear factor from those “confusing” tables and views. One particular function we can use for an option list is the Tree selection. It is a core piece of Folders but without the performance heavy overhead. In our scenario, we have a very busy auto parts store and body shop. The shop manager wants the users to have the option at check-in to assign metadata such as the year, make and model of a vehicle that the shop custom fabricates specialty parts for. The shop UCM administrator armed with an arsenal of documents from the 10g and 11g document library takes on the task and hopes to have the project done in a few days. With our help we will reduce that time to a project that can be done before lunch time. First let’s begin with creating our information field. Now we can begin creating our tables. 5) Repeat steps to create remaining tables and columns below. 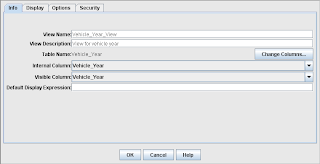 5) Repeat steps to add views for Vehicle_Name, and Vehicle_Model. Now that our views are added we are going to need to add the data that will be displayed for the end users. Now that we have populated our views data we can link or relate the newly created tables. All that is now left to do is configure our field. 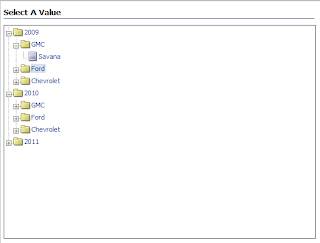 1) Click on Information Fields and select “Vehicle” field. 9) Click drop-down to build third level of tree. 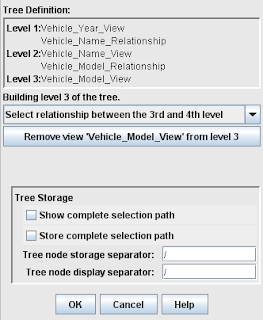 Select “View_Model_Relationship” and click “Ok” three (3) times to complete tree definition. Our Tree option list is finally complete. To validate, we just need to go to the check in page. In the check-in page there is a new field labeled “Vehicle”. Click “Select” then drill down to make sure our tree displays positive results. Now suppose the auto shop manager would rather have a dependent option list, where only information is displayed based on a previous selection. Once again to validate changes go to check-in page and make sure the correct variables are showing. There you have it, not one but two option lists before lunch time. This was a couple of examples of option lists, with careful planning and always on a “dev” instance first, more powerful and robust lists can be created. Any questions or comments please reach me at lou.guerrier@senasystems.com.